The White House has posted some Christmas decorations facts and received the tree. UPDATE: Link to the first lady’s remarks, with video. 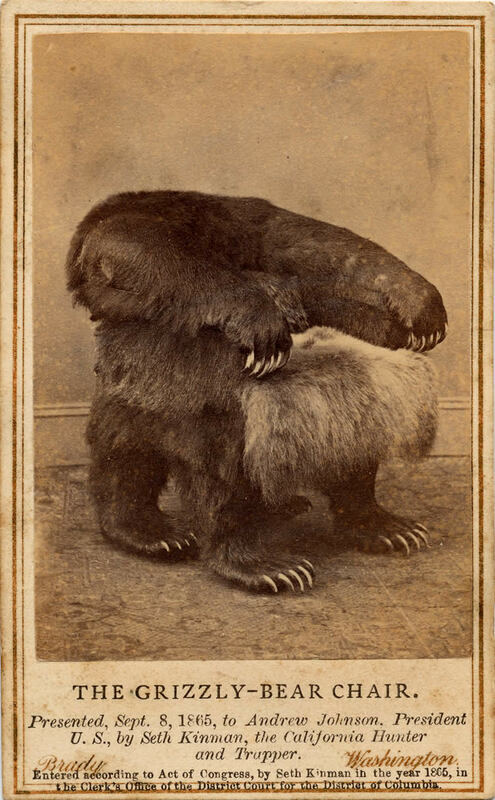 I stumbled across a page with some information about the fantastic grizzly bear chair that Andrew Johnson had in the his library (the Yellow Oval Room). Made from two grizzly bears captured by Seth [Kinman]. The four legs and claws were those of a huge grizzly and the back and sides ornamented with immense claws. The seat was soft and exceedingly comfortable, but the great feature of the chair was that, by touching a cord, the head of the monster grizzly bear with jaws extended, would dart out in front from under the seat, snapping and gnashing its teeth as natural as life. This chair Seth presented to [President] Johnson, September 8, 1865. Yes, the head would dart out from underneath… natural as life…. Of course, everything recorded must be public domain, but so far all I’ve found that interests me in terms of WH material is TR’s letters to his children. I suppose most presidential speeches are public domain, but can anyone think of something more closely related to the White House? Ike Hoover’s memoirs would be fun, but I don’t think they’ve fallen out of copyright (everything before 1923 is PD and anything until that wasn’t renewed after 28 years is PD; more recent stuff has different protection). UPDATE: After another quick search, I think I might do Herbert Hoover’s wildly-optimistic 1929 State of the Union address, altho it’s rather long (they got much shorter later on). Got a question about Jackson’s White House from a fiction author, so, in addition to replying with details, I added an 1829 diagram to the Residence second floor page. Added a couple of Coolidge era pics and also one of the diagram of the Kennedy Vermeil Room in blue and the Ford Library. I still haven’t identified the location of those mysterious ones, but these seemed interesting. I’ve basically run out of sources that I know of, altho there are a couple of magazine pictorials that I don’t have. WhiteHouse.gov seems to be giving me a 404 – File Not Found error today…. Wait, spoke too soon. I guess I caught them in the middle of a change. Anyway, the Prime Minister of Japan visited the other day. It’s amazing how they sneak these guys in and out. It’s like you’ve got to watch the news to catch it or something. Maybe I get more of my news from The Daily Show than I’d like to admit. On a side note, there still is no new WH video for the renovated Press Briefing Room, and we’re two press secretaries behind now. Nor do we have any new pictures of the press secretary’s office, even just during a press gaggle. The Park Service is planting a magnolia tree in front of the Residence. It seems rather… centered. I hope they aren’t obscuring the view of the house from the street. Security is one thing, but Lincoln didn’t hide behind any foliage. What next—a presidential ghillie suit?